CHINA. Tai Ping Rebellion "Tian Guo Sheng Bao" (Taiping Heavenly Kingdom Sacred Treasure). Silver 1/4 Tael, ND (ca. 1850-64).27.55 mm; 9.12 gms. 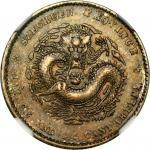 Wenchao-pg.#804-5 & #1401-3 (rarity four stars); Mailliet-pg.269#1; KM-2 (listed as 5 known); cf.Schjoth-1608. EXTREMELY RARE, veryinteresting, and historically very important. <br /><br /><br /><br /><br /><br /><br /><br /> Inthe mid-nineteenth century the use of opium spread far and wide throughout China,several rebellions occurred because of this. The Tai Ping rebellion, whichkilled over 20 million people, fought against opium and for aCommunist-Christian form of government. From 1851 to 1864 the country sufferedfrom the revolution that was led by Hong Xiuquan, a visionary who had beeninfluenced by a dream, felt that he was called to rid China of idolatry andcorruption. He became obsessed with the idea that he was a brother of JesusChrist, fated to rule all of China.<o:o:o:o:p></o:o:o:o:p><br /><br /><br /><br /> Hongs "Heavenly Kingdom of Great Peace" Tai Ping TienKuo, issued a number of cast bronze cash coins. All are scarce now, but wereplentiful at the time and saw wide circulation. When the rebel capital Nankingwas captured by the Imperial troops in 1864, the slaughter was beyond belief.The general in charge of the operation reported that not one of the rebelssurrendered, and everyone had to be killed. Over 100,000 were murdered in thatcity alone, and some parts of the country were so badly depopulated that theeffects were still felt at the turn of the century.<o:o:o:o:p></o:o:o:o:p><br /><br /><br /><br /> During the brief glory days of the Tai Ping Kingdom, theyissued not only bronze cash coins, but also a unique form of silver and perhapseven some gold coinage. The silver pieces weighed one-half and one-quartertael. 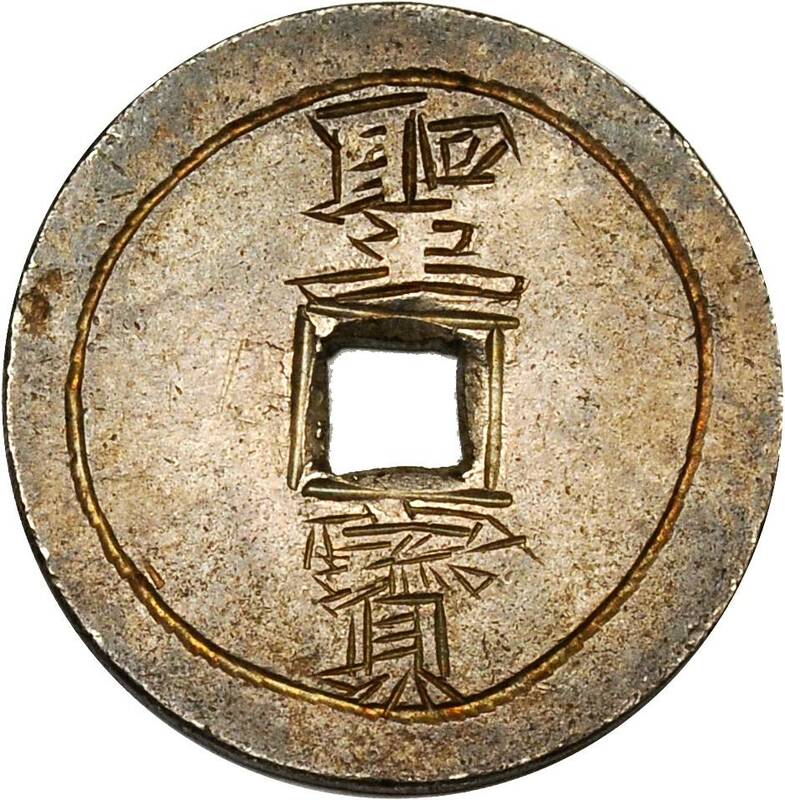 Each coin was individually hand inscribed with the characters "Tien Kua"(Heavenly Kingdom) on the obverse, and "Sheng Pao" (Sacred Currency) on thereverse. There is no explanation as to why this labor-intensive hand engravingtechnique was used. 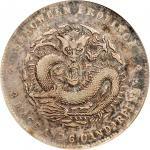 Production must have been very limited, and perhaps thecoins were used only for special purposes. The few remaining pieces known todayverify that they were never common. Tothe best of our knowledge these pieces were first published in Brussels Belgiumby Mailliet in the reference "Atlas des Monnaies Obsidionales et de Necessite",1868.<o:o:o:o:p></o:o:o:o:p><br /><br /><br /><br /> A survey of private collections and museums reveals thata very small number of pieces are known to exist. The following is a list ofthe surviving pieces of which we are aware. <o:o:o:o:p></o:o:o:o:p><p>1) SmithsonianInstitution. 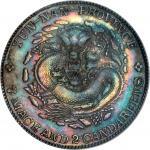 Ex: Glover collection, acquired in 1897.<o:o:o:o:p></o:o:o:o:p><br /><br /><br /><br /><p>2) Howard Simmons(British coin dealer). Sold in 1984.<o:o:o:o:p></o:o:o:o:p><br /><br /><br /><br /><p>3) Dr. Che-lu TsengCollection. Ex: Bruce Smith 1984.<o:o:o:o:p></o:o:o:o:p><br /><br /><br /><br /><p>4) David LohCollection. Ex: Scott Semans June 1991 Auction lot# 757 "The Daniel K.E. Chingcollection".<o:o:o:o:p></o:o:o:o:p><br /><br /><br /><br /><p>5) The General M.S.Newton/Kenneth Bressett Collection (example offered here).<o:o:o:o:p></o:o:o:o:p><br /><br /><br /><br /><p>We are also aware of theexistence of approximately a dozen examples of the ½ Tael. 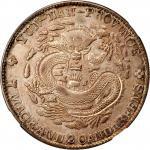 Most notably are thepieces housed in the Smithsonian Institution, Ex: Glover collection acquiredin 1897; The British Museum example acquired in 1903; and the American NumismaticSociety specimens purchased in 1928.<o:o:o:o:p></o:o:o:o:p><br /><br /><br /><br />EXTREMELY FINE.Newton / Bressett Collection.